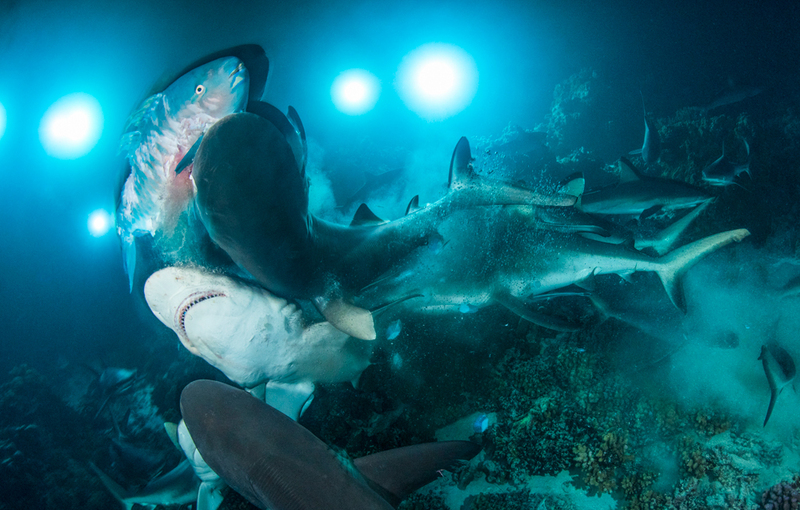 A thrilling photograph showing the exact moment a pack of grey reef sharks catch and devour a parrotfish has won British photographer Richard Barnden an international photography prize. 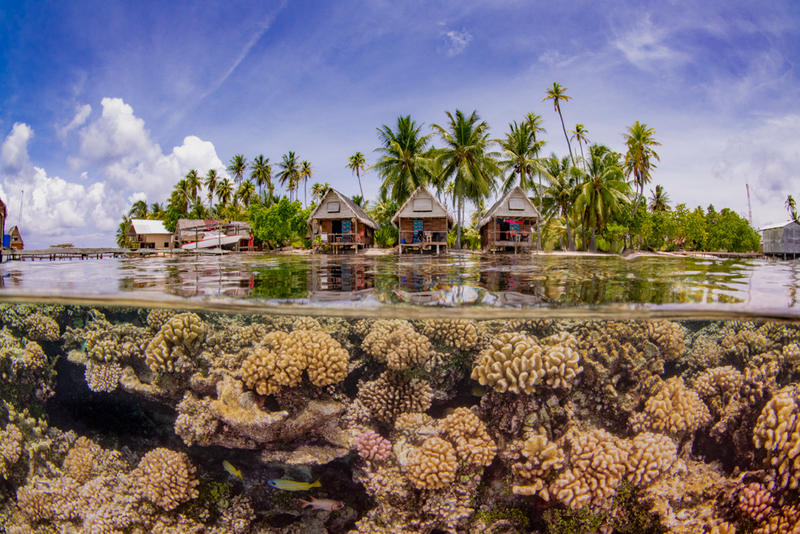 The Underwater Photographer of the Year competition has announced its 2019 winners and a British photographer has taken the top title. Richard Barden captured the image of feeding grey reef sharks, titled 'The Gauntlet', late at night on the reefs of French Polynesia in the centre of the Pacific Ocean and his image was chosen from 5000 entries submitted by underwater photographers from 65 countries around the world. Commenting on his photo, Richard said: "As I descended, hundreds of sharks covered the bottom. This unlucky parrotfish flinched, and that tiny movement alerted the swarm of sharks. The mayhem hurtled straight towards me and I instinctively pressed the shutter, moments later all that remained was a rain of parrotfish scales in the darkness, and this photo on my camera." Chair of the judges, Dr Alexander Mustard MBE, commented: "Photography is about preserving moments and what an unforgettable instant this is." He continued: "Using a wide-angle lens, the photographer takes us into the full drama of the hunt, as a melee of grey reef sharks rise like a breaking wave to tear apart their prey, truly revealing the ocean’s wilder side." Spanish photographer, Eduardo Acevedo from Tenerife, was named Marine Conservation Photographer of the Year 2019 for his photo showing a loggerhead turtle entangled in a discarded plastic fishing net while Korean Taeyup Kim was named as the Up & Coming Underwater Photographer of the year 2019 for a technically challenging image half in and half out of the water. The title of Most Promising British Underwater Photographer, 2019 goes to Malcolm Nimmo from Plymouth in England. His image 'Marine Compass' was taken while snorkelling in the Scilly Islands, in the UK. Underwater Photographer of the Year is an annual competition, based in the UK, that seeks to celebrate photography beneath the surface of the ocean, lakes and even swimming pools. British photographer Phil Smith was the first underwater Photographer of the Year, named in 1965. Today’s competition has 13categories, testing photographers with themes such as Macro, Wide Angle, Behaviour and Wreck photography, as well as four categories for photos taken specifically in British waters. 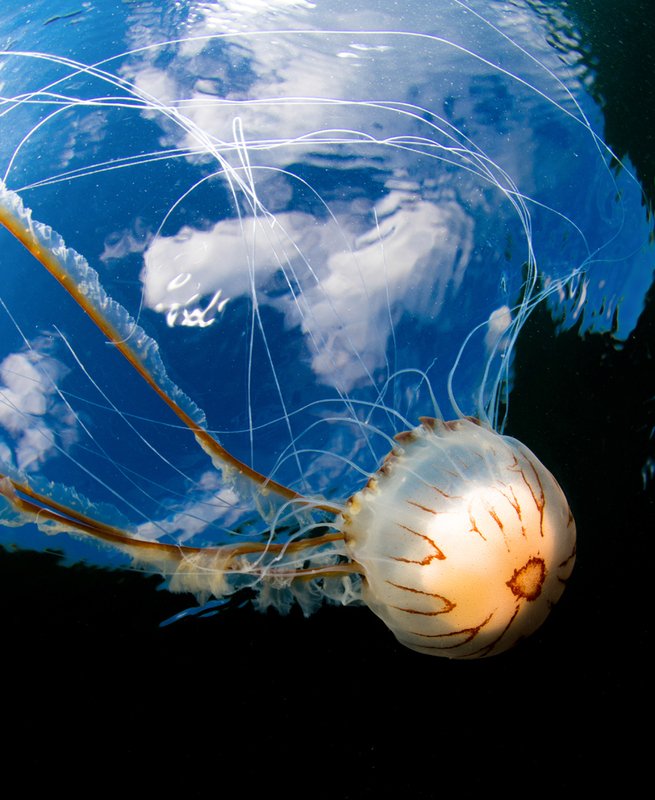 This year’s judges were experienced underwater photographers Peter Rowlands, Martin Edge and Alex Mustard. For more information, and to see more images, visit the Underwater Photographer of the Year competition website. Last year, German photographer Tobias Friedrich was named the Underwater Photographer of the Year for his image of British World War II military vehicles deep inside a shipwreck in the Red Sea. I'm struggling to see what that first picture actually is??? ?